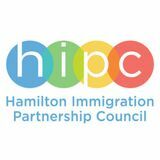 Message from Chair On behalf of the Hamilton Immigration Partnership Council (HIPC), I am pleased to provide you with an overview of key deliverables and significant milestones achieved this past year. Council members, community partners and newcomer residents have freely given their energy and time in achieving these notable accomplishments. 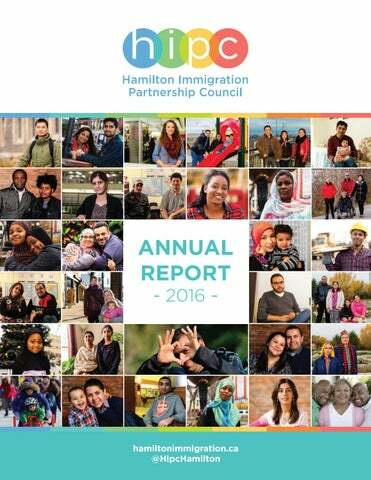 You will see in this HIPC Annual Report Summary that significant progress has been made in advancing the priority of ensuring Hamilton remains a hallmark community in welcoming newcomers and refugees. This past year was distinguished by a significant investment in revitalizing the governance structure of HIPC and establishing a robust strategic plan for 2017 â&#x20AC;&#x201C; 2020. The new strategy will be launched on March 29, 2017. A reflection on this past year would not be complete without acknowledging the outpouring of support and assistance offered by citizens of our community in helping Syrian refugee families arriving in Hamilton. Collectively, resources were marshalled and groups rallied to provide aid in many different forms to ensure families and children could begin to build new lives in Canada. HIPC was proud to contribute to this important humanitarian effort. Among a number of key achievements, HIPC has proactively put into place a strong communications plan to showcase the important role that newcomers play in the economic, social and cultural vibrancy of the community. Through social media and our website, we have made available a wide range of resources, publications and digital materials that speak to Hamilton as a welcoming city. Through a number of key events, HIPC brought together critical stakeholders to strengthen community networks, to coordinate planning efforts and to celebrate the diversity that represents the City of Hamilton. Thank You #HamOnt and Employers Embracing Diversity are just two examples of the work HIPC undertook to advance its new vision. I wish to express our sincere appreciation to the dedicated members of the Council and HIPC staff for their unwavering support and assistance this past year. I look forward to continuing our collaboration in the year ahead as we strive to be an exemplary sanctuary community for the betterment of all. Communications In 2016 HIPC developed a communications plan to increase awareness of its purpose, partners and activities. The plan included redeveloping the HIPC website, using social media to engage with the community and showcasing HIPC’s work through stories and videos. Phase HIPC facilitated a new relationship with the YWCA’s Women in Technology Program to conduct research on promising website practices among Local Immigration Partnerships. Phase The new website, redeveloped in partnership with Information Hamilton, includes information on HIPC, toolkits and guides for newcomers, newcomer success stories, community events, news and an interactive map of service providers in Hamilton. Phase Launched in April 2016, the web pages have been viewed over 26,600 times. ‘Fred Eisenberger: Welcoming the world to Hamilton’ - Opinion editorial authored by Fred Eisenberger, Mayor, City of Hamilton on welcoming refugees and newcomers to Hamilton. - Article authored by Jeff Mahoney on the ‘Thank You #HamOnt’ event organized by HIPC. - Opinion editorial authored by Judy Travis, HIPC Chair 2015 - 2016, and published by The Hamilton Spectator on February 10, 2016. The article highlighted Hamilton’s rich history of welcoming and integrating newcomers and the important role that HIPC continues to play in helping Hamilton’s settlement sector move towards a shared approach. HIPC worked with Global Hamilton, Advisory Committee for Immigrants and Refugees, New Horizons Media and Mohawk College to showcase newcomer experiences and the different settlement programs and resources that help welcome newcomers to Hamilton.  hank You #HamOnt T Video showcasing how the Mayor’s Advisory Committee on Syrian Newcomers, HIPC partners and Hamiltonians from across the city worked together to welcome and support Syrian newcomers. Four new Canadians shared their stories of success in Hamilton, highlighting their participation in the workforce and the valuable skills immigrants bring to our economy. HIPC’s communications strategy broadened its partner’s network of community members and organizations involved in newcomer settlement and integration. HIPC’s communications initiatives increased awareness of newcomer needs, provided greater exposure of community initiatives to support newcomers and enhanced Hamilton’s capacity to be a welcoming city for all. tegic planning by producing several resources and research documents. HIPC responded to local service providers’ needs and enhanced the accessibility to information for newcomers. Community Engagement HIPC has over 85 partners representing community services, settlement organizations, different levels of government and private sectors. Each year HIPC and its working groups organize and attend events, conferences and roundtables to connect to the community and engage with newcomers. HIPC staff attended a total of 25 events and conferences in 2016 and 2017. Over 120 newcomers participated in skating events during the Hamilton Winterfest in 2016 and 2017. HIPC coordinated community engagement and skating opportunities for newcomers with Tourism Hamilton. Participants also shared their thoughts on “How can Hamilton be more welcoming?” Their responses helped shape HIPC’s new vision, goals and activities. HIPC partnered with MP Filomena Tassi, the City of Hamilton’s Mayor’s Office, Immigrants Working Centre and Wesley Urban Ministries to organize the #WelcomeRefugees Information Fair on March 01, 2016. Over 100 newcomers, community members and service providers attended the free event. The event showcased 25 local organizations and groups that offer information and services to immigrants and refugees. Employers Embracing Diversity Forum HIPC partnered with Workforce Planning Hamilton, RBC and the Mayorâ&#x20AC;&#x2122;s Advisory Committee on Syrian Newcomers to host the Employers Embracing Diversity Forum on October 27, 2016. The forum showcased local supports and encouraged employers to hire newcomers. Service provider organizations shared information with employers on programs and incentives for hiring newcomers. Over 200 people including community partners, Hamilton volunteers and Syrian newcomers gathered at City Hall on November 29, 2016 to celebrate community efforts to welcome Syrian newcomers to Hamilton. The event was organized by HIPC and the Mayorâ&#x20AC;&#x2122;s Advisory Committee on Syrian Newcomers.  amilton Living Together Symposium H A symposium to explore ways of working together to create a vision for an inclusive, harmonious community March 29, 2016. HIPC engaged community partners and stakeholders through events, roundtables and conferences resulting in strengthened local, provincial and federal partnerships. HIPC’s engagement efforts in the community increased awareness of newcomers’ needs and has allowed for organic, innovative and sustainable partnership development. Employment Focus As part of HIPC’s community consultations, newcomers and immigrants identified employment as the leading barrier to settlement, specifically not being able to secure employment in one’s own field of experience. HIPC developed a strategy to showcase immigrant talent in Hamilton and raise awareness among employers on the needs and skills of immigrants. Employers Embracing Diversity Series HIPC coordinated a media series titled: “Employers Embracing Diversity” for the Hamilton Spectator, in partnership with Workforce Planning Hamilton and Global Hamilton. The seven articles published in this series created greater awareness of the contributions of immigrants and internationally trained professionals to the Canadian economy and highlighted promising human resource practices. Employers Embracing Diversity media series. These include: Royal Bank of Canada, Rockwell Automation, Canada Bread, Hamilton Health Sciences, Collège Boréal, Coppley and Marchese Health Care. 	HIPC partnered with the Job Developers Network to distribute the Employers’ Roadmap in Hamilton. sharing information, HIPC identified and addressed some of the employment challenges faced by newcomers. This project highlighted immigrant skills, made resources accessible to employers looking to hire newcomers in Hamilton and helped local employers understand the value of embracing diversity in the workplaces. The Government of Canada resettled over 40,801 Syrian newcomers in more than 350 communities across Canada between November 4, 2015 and January 29, 2017. Ontario received 16,956 (42%) of the national total, out of which 1491 (4%) have since called Hamilton home. Of the total Syrian newcomers welcomed in Hamilton, 86% are Government Assisted Refugees (GARs), the third highest total of Syrian GARs welcomed in Ontario. Hamilton received the 4th highest total of all Syrian newcomers welcomed in Ontario – a total amount that is approximately 4 times higher than the average yearly intake of refugees in Hamilton from 2011 to 2015.
collaboration with Hamilton Centre for Civic Inclusion (HCCI) and Wesley Urban Ministries. 	Organized the ‘#WelcomeRefugees Information Fair’ on March 01, 2016 in partnership with MP Filomena Tassi, the City of Hamilton’s Mayor’s Office, Immigrants Working Centre and Wesley Urban Ministries. The HIPC Settlement Working Group contacted a list of 200 ethno-cultural and faith based organizations in Hamilton and invited them. Hamilton. 	Developed and distributed a “Welcome to Hamilton” Settlement Services information card. 	Translated and distributed the City of Hamilton’s Canada Day event poster in Arabic. 	Created 100+ Newcomer Resource packages in Arabic and English for city-wide distribution at Ontario Works offices. 	Disseminated all resource guides and tools via the HIPC and the City of Hamilton’s websites. 	Highlighted HIPC’s resource guides and website as a panelist at the Inform Ontario Education & Networking Symposium. 	Provided support to the development and maintenance of the City’s Syrian webpage: www.hamilton.ca/syriannewcomers 	Collected and posted community Syrian refugee events and stories. Projects in Progress 	Four employment videos are being translated into Arabic by HIPC, Adult Basic Education Association (ABEA) and Mohawk College. Completion date: May 2017. 	A resource sheet on English language service providers in Hamilton is being produced. Completion date: April 2017. 	A workshop for language and employment service providers working with newcomers in Hamilton will be organized on April 21, 2017. The workshop will explore innovative ways of working together. Workshop date: April 21, 2017. 	The Syrian Newcomer Resettlement Evaluation is in progress. Completion date: May 2017. HIPC’s strong network of partners resulted in strategic community collaborations with the goal of resettling Syrian newcomers in Hamilton. HIPC helped in identifying gaps and opportunities, connected essential stakeholders and engaged newcomers. By adopting a leadership role between the municipality and community partners, HIPC shared information and equipped service providers and newcomers with the resources they needed to facilitate the settlement process. HIPC also engaged with local residents to foster a welcoming environment for newcomers and refugees. Governance and Strategic Planning Since 2009, HIPC has come a long way in bringing together community leaders and supporting initiatives to help newcomers settle in Hamilton. Building on HIPC’s success, the 2016 strategic planning process reconnected with partners and newcomers to understand how HIPC can continue to remain responsive to community needs. The consultations helped HIPC shape new priorities for the successful integration of newcomers to Hamilton and the creation of a welcoming community. The strategic planning process included: 	Consultations with HIPC partners and five working groups: Housing, Settlement, Employment, Health and Language. 	Engagement with 15 community leaders representing health services, settlement agencies, Police services, Emergency services, HIPC staff, City Council, the Mayor’s office, the French Catholic School Board, the post-secondary educational sector and former HIPC members. 	Engagement with immigrants from five local neighbourhoods. 	Research on LIP governance model best practices. 	Full-day strategic planning session with 21 HIPC Council members. The consultations highlighted the need for HIPC to focus its efforts and resources to advance the following areas: Coordination of Newcomer Services, Communications, Community Engagement, Research and Evaluation. Three Ad Hoc strategic planning committees were established to further develop these priority areas and to identify next steps: Communications and Community Engagement, Coordination of Services, Research and Evaluation Between April and May of 2016, HIPC disseminated the results of the consultations to Working Group members and transitioned HIPC’s five working groups towards membership on one of three new Ad Hoc strategic planning committees and/or membership on one of the working groups created to support the Mayor’s Advisory Committee on Syrian newcomers. Several HIPC members chose to be a part of both the strategic planning committees and the Mayor’s Advisory working groups which is acknowledged as a considerable commitment of time and effort. HIPC’s three Ad Hoc strategic planning committees developed the committee’s Terms of Reference and planned projects aligned with HIPC’s vision and strategic priorities. On December 15, 2016, the committees identified cross cutting projects and task teams to support HIPC’s vision for 2017-2020. Next steps The strategic planning process has resulted in an exciting new strategic direction, priorities and areas of focus for 2017-2020. HIPC’s implementation plan will operationalize the strategy through priority projects and actions to bring the HIPC vision to life. HIPC will regularly evaluate its plan and re-evaluate priorities against emerging community needs and immigration trends in order to be responsive and flexible to the Hamilton community and its partners. Special thanks to the Hamilton Immigration Partnership Council and its community partners who have volunteered their time in support of the council and its subcommittees. Of note, several HIPC members demonstrated exemplary dedication to both the Syrian refugee resettlement project through the Mayor’s Advisory Committee on Syrian Newcomers and to the HIPC strategic planning project. Thank you for all that you have done, and continue to do to make Hamilton a welcoming community for newcomers.